In addition to inspecting bridge decks and pavements, Penetradar's IRIS GPR system is also effective in non-highway related inspections such as geotechnical and environmental surveys. 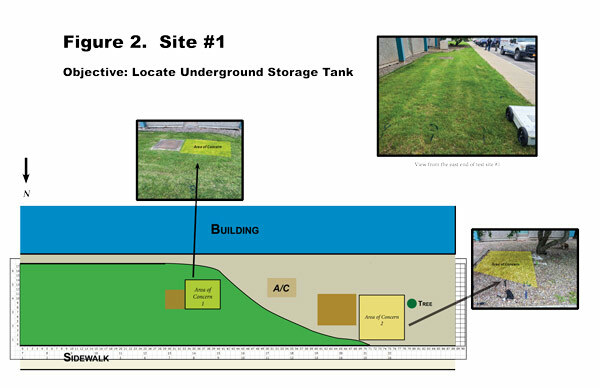 These types of surveys include, but are not limited to detecting and locating underground storage tanks, determining depths of water tables and bedrock and locating hazardous spills and buried objects. 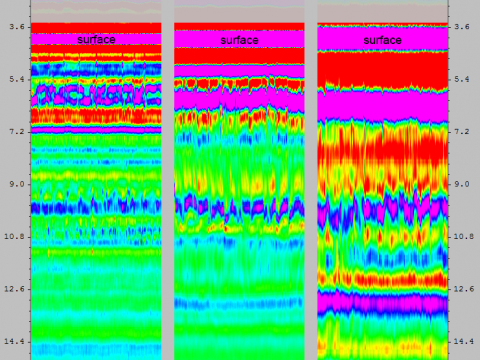 The technology behind Penetradar's IRIS GPR system is used for these types of surveys in a similar way to detecting deterioration in bridge decks. The difference between them is the signatures found in the waveform from the returned echo of the signal. Depending on the type of survey, the return echo in the waveform will display certain characteristics for detections. As can be seen in our products section, Penetradar employs an array of antenna configurations to fit the need of a survey. This ranges from the non-contacting horn antennas to the ground contacting antennas which are optimized for penetration depths up to 4 meters. 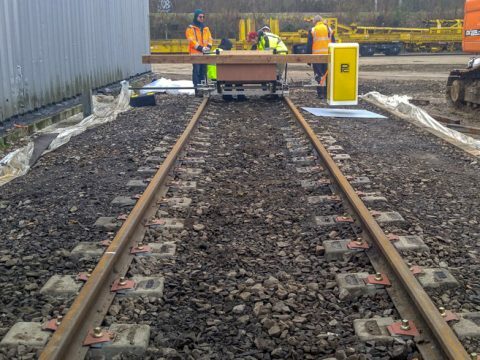 Because of this the ground contacting antennas are ideal for geotechnical and environmental surveys. 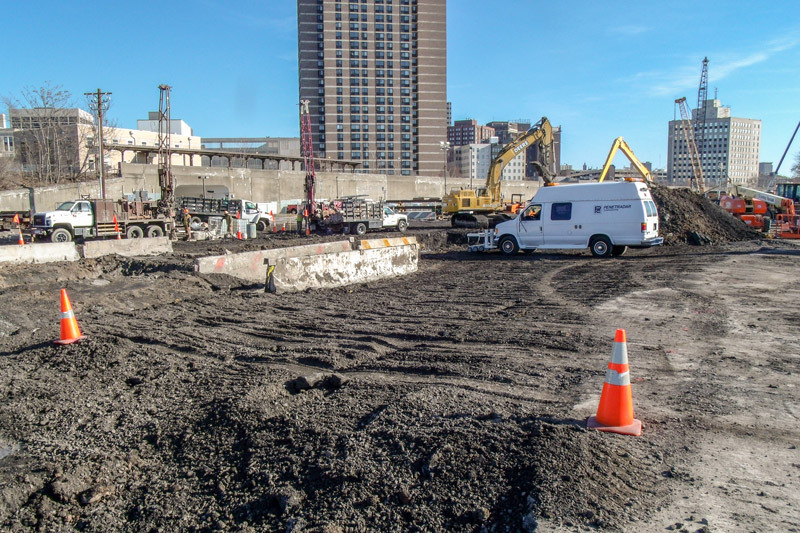 Penetradar's vehicular based GPR inspection system shown (in the background) with a Model 301B (ground contacting) antenna attached to the front of the vehicle surveying a construction site for buried objects and rubble from a past structure. 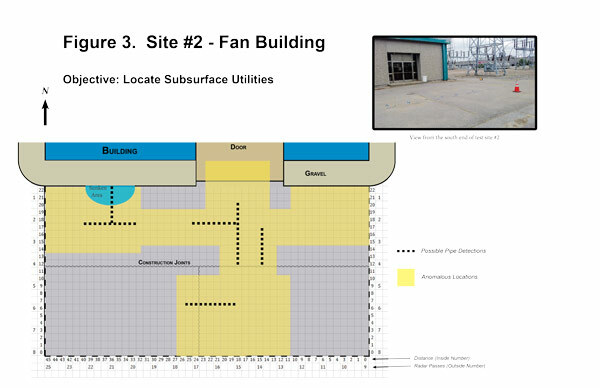 The Model 301B antenna was able to detect subsurface objects up to depths of fifteen feet. 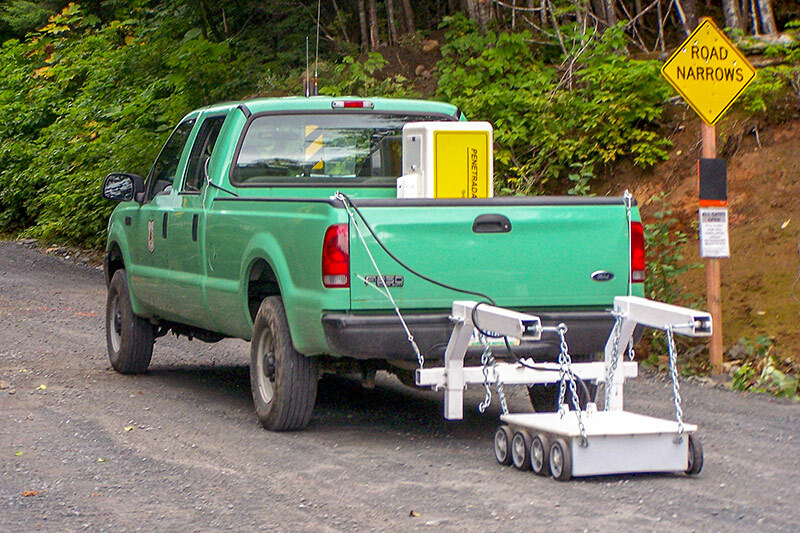 Penetradar's vehicular based GPR inspection system shown with a Model 301B (ground contacting) antenna surveying a site for the presence of a bedrock layer existing under the roadway. 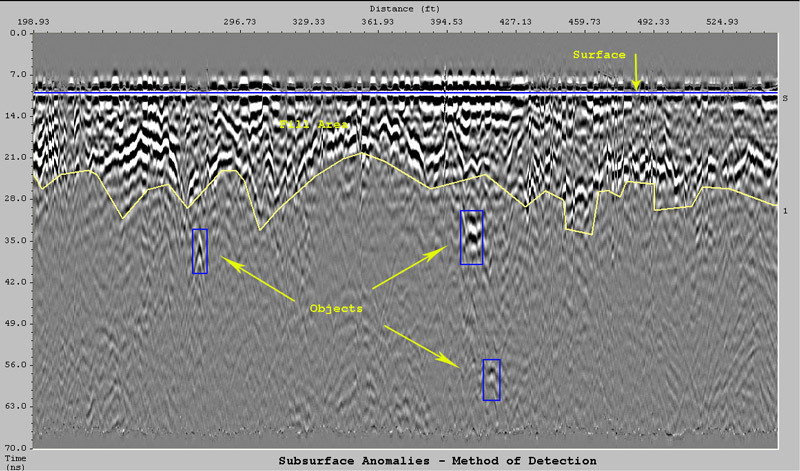 Shown above is an example of detecting the spatial location and depth of subsurface objects in Penetradar's ColorPro software (in greyscale). These distinct areas of detection appear as hyperbolas. As the antenna passes over the surface, the transmitted signal travels through the material (such as soil) and is reflected off of an object (when present). The return echo is captured and as the radar continues over the surface, the resulting image is in the form of a hyperbola. After analysis, we can provide an unique set of results based on the needs of your projects. 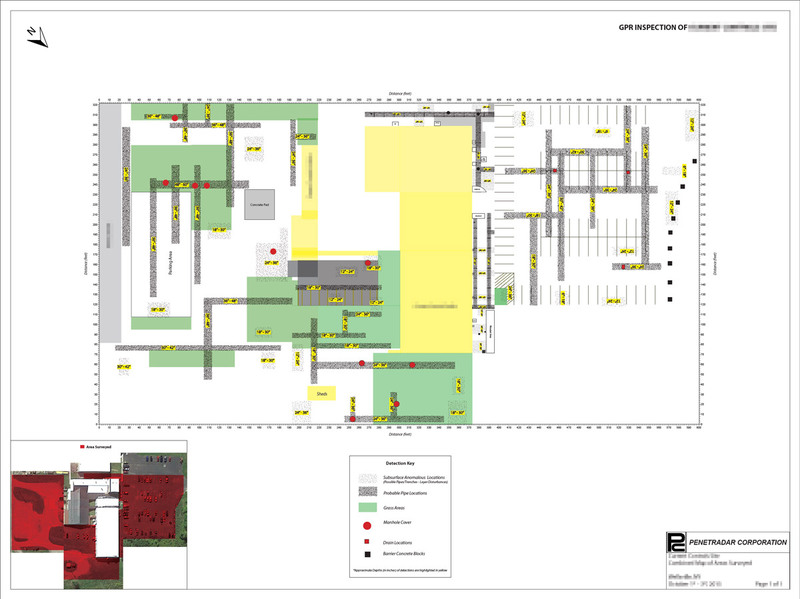 Some example map from previous site surveys can be seen below. If drawings or plans are not provide, we can create our own for the use of showing detections and results on (as is the case in the examples below).